It has been a fairly boring week which is nice for a change...I have been dragging my feet getting my proposals ready for the next issue of Cast On. I know what I will be doing next week! I only received one lesson to review this week. I guess everyone is in holiday mode. I got a request from someone who had signed up for the Basics course a while back. Again, as long as I am the instructor of the course, you can continue with it even after a year has past. When I first started teaching the course I would mail the materials but now I email them. This has allowed me to keep the cost the same. The tip this week is how to work the cable cast on. 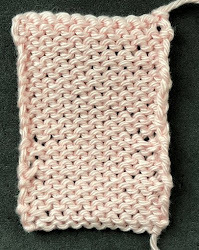 This is a very simple cast on, one that many beginning knitters learn as it uses knitting needles. It produces a very firm, non-elastic edge. (Hint: This isn't a cast on to use if you want a stretchy edge, say for a baby hat.) About the only time I use it is when I am making one-row horizontal buttonholes. As for many cast ons, there is a smooth side and bumpy side. This photo shows the smooth side. This is the bumpy side. When you are using a cast on with smooth and bumpy sides, be consistent within the project as to which side you select for the right side of the work. Which you choose, doesn't matter as long as you are consistent. This photograph shows the smooth side of the cast on for the right side of the work. This is the wrong side. Notice how well the bumpy side of the cast on blends in with the reverse stockinette. This week's salon will be on Sunday from 2:00-4:00. The Met auditions are on Saturday and I am hoping to get there for at least part of it! It is always a great event. I am making good progress on the gift front. I had quite a bit of time to knit this week. If I could only stop ripping things out I would get more done. I decided to make chain mail shawls for Cynthia and Jordan. They live in Dallas. I used Berroco Elements which is a metallic yarn. It is perfect for this project. The photograph doesn't do the yarn colors justice. They are gold and silver. This slouch hat needs to be blocked which I haven't done yet. You can't really see the pattern. I will do the finishing on all of this stuff later. I decided to put a blue stripe in the hat so that it will match the mitts. I am making a pair of cashmere mitts for Martha to give to her sister-in-law. Yes, I can be very nice when I want to be. I spent the early part of the week in Zanesville. On Monday we had a meeting about conference in San Diego in July. I am very excited. We have lots of fun things planned. The Yarn Tasting will be even bigger and better than last year. Stay tuned. On Tuesday we had the photo shoot for the Spring issue. It was a very windy and sunny day. Luckily, the cold front hadn't moved in yet or we would have had a miserable time. This photo more or less sums up the day. We were avoiding the sun like vampires. (The garment is a linen top...very cute.) The model is Julia who is a dream to work with. Sadie and Susan, the stylist are trying to provide some shade. I've decided to do just one more tip about tubular cast ons. There are quite a few techniques out there. I've even done one myself where you use Judy's Magic Cast On (most frequently used for toe up socks). Tubular cast ons are basically double knitting for a few rows. In this technique you cast on directly to the needle all of the stitches you need. (If you remember, when you use the crochet chain method, you have a chain stitch for half the number of stitches plus one.) It is basically the same cast on you use for a provisional cast on. Salon will be on Saturday from 1:30-3:20. If you need an incentive to come out in this cold weather, I picked up some Goumas chocolates in Granville which I am going to share! I thought I'd share one more photo from the shoot. This is the jacket I did a few months ago. My nephew wants a hat for Christmas and black is the color choice. I used a skein of Berocco Ultra Alpaca. I didn't notice until I had worked about 5" that I was using Size 5 needles instead of Size 6. Oh well, he lives in Utah and a dense, warm hat will work. I used my pattern for the Confident Beginner pattern. My niece wants a scarf. The yarn is a DK Madelinetosh and it is yummy. I have a skein left and if I have time, I will make a hat as well. I'd like to use the sawtooth edge as well. I had enough Seahawk Green to make a hat. This yarn isn't the easiest to work with and after several experiments I determined a simple watch cap would be the best thing to do.